These two fresh fig recipes are perfect if you are looking for something a tad unusual to serve as an entree. Fresh figs are such beautiful fruits to look at that they add elegance to any dish. If you are lucky enough to find them, you should definitely give them a try. Choose slightly soft, wrinkled fruits, that have a plump feel with no signs of mold. Do not buy hard, smooth figs. The fig does not ripen after it is picked. If you can pick them off the tree yourself, look for a wrinkled, soft fruit with a drop of nectar hanging from it. I wouldn't bother storing them in the refrigerator. It kills their flavor and they're not lasting long no matter what you do. Keep them arranged so they are not touching each other. Most importantly, eat them quickly! You can eat all of the fig, except perhaps for a hard point where it hung from the tree. Just be sure to wash before enjoying. 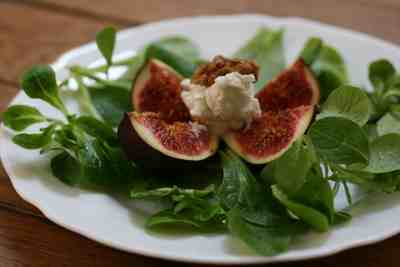 In France you will often find fresh figs featured in salads along with a sharp tasting cheese, as in the recipe below. Other popular accompaniments to raw fresh figs are ham and smoked salmon. Figs are used similarly to prunes to create salty sweet contrasts in cooked meat dishes. You will find fresh fig recipes for desserts such as a clafoutis, as well as baked by themselves. And of course, they are eaten just as they are, preferably warm from the tree! Both of the fresh fig recipes below feature an interesting contrast of flavors. In the first, one of our easy salad recipes, the sweet fig is played against the salty cheese and the tart vinaigrette, and in the second, it is the hearty, salty taste of raw cured ham that provides the perfect accompaniment to the fruit. Both of these recipes are meant to be served as entrees, but you may find them satisfying enough by themselves served with a good baguette to make a light meal. Wash the figs. For an attractive presentation, cut the fig in four without cutting through the stem, and allow the fruit to fan open. Garnish four salad plates with the greens and the figs. Place one ounce of cheese alongside the fig, and sprinkle with walnuts. Prepare a vinaigrette with the olive oil, walnut oil, vinegar and salt and pepper. Pour on top and serve. Wash the figs and cut them in two. Place them peel side down in a baking dish. Pour a little honey on top of each half, then sprinkle with the parmesan, and finish by placing a small amount of butter on each. Bake in a 400° F oven for about 10 minutes. Place four fig halves on four salad plates along with the ham, which you can roll into a log for an attractive presentation. Fig trees, which originated in the Mediterranean region, can grow to be a hundred years old and a hundred feet tall! You'll never see a flower on a fig tree, because the flower is contained inside the fruit itself. There are two sorts of fig trees, those that produce fruit twice during the year (once in the summer on the wood from the previous year and once in autumn on the new wood) and those that only produce once. You can find fresh figs from the end of summer until late autumn. There are hundreds of different varieties of figs. Mission Figs, a popular variety in North America were introduced into California by the Fransican missionaries. You can also easily find dried Calmyrna Figs.